“Thank you guys, SO much. 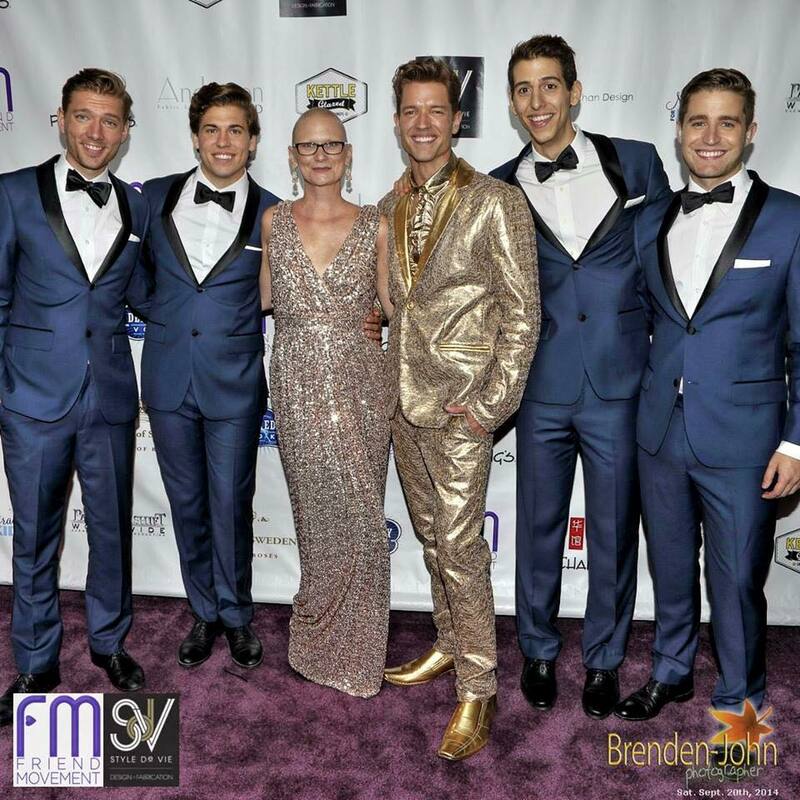 I met Ronnie before being diagnosed with cancer and I saw what the Friend Movement was doing. I have five children so I grabbed onto it. 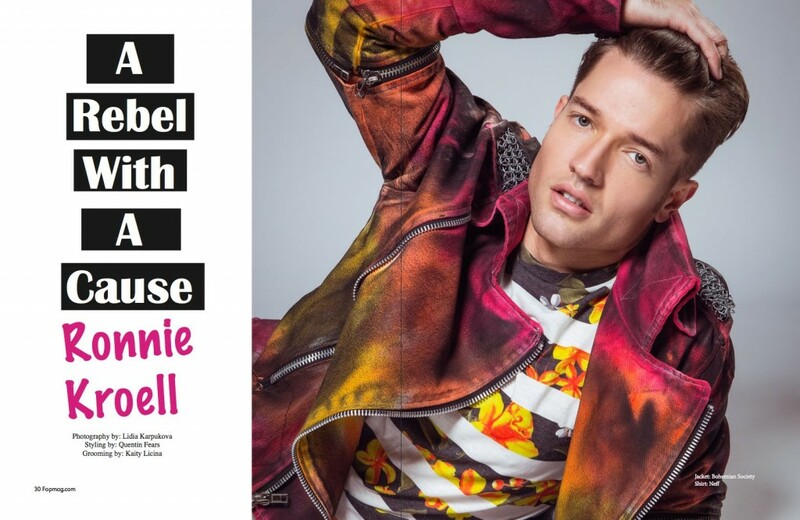 Ronnie is so amazing and the work that the Friend Movement is doing is saving lives. It’s inspiring others. I’m often told what an inspiration I am and I clearly tell people real quick that I’m not. It’s the love from others that inspired the greatness to fight this disease that I’m fighting. Everyone deserves love like that and friendship like that. 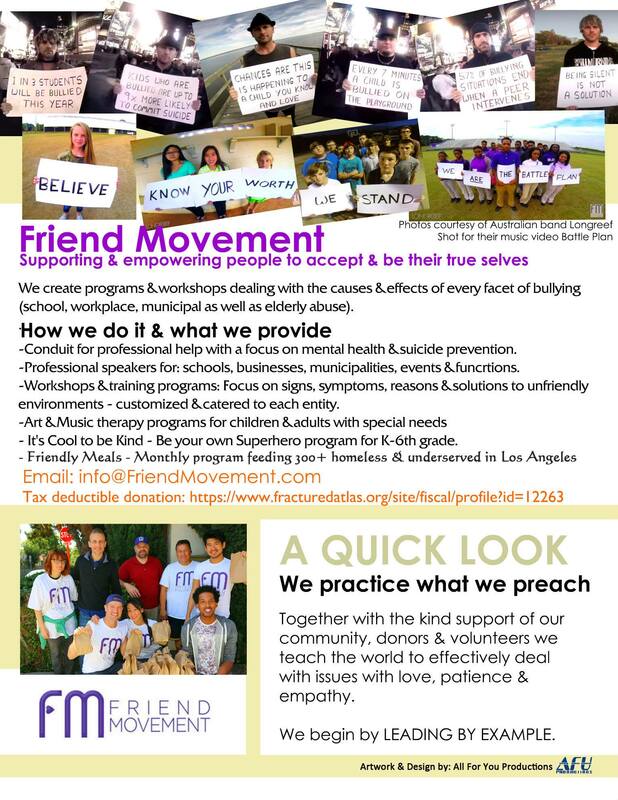 The Friend Movement is taking the emphasis off the bullying and putting the emphasis on friends. A lot of people believe that change can’t happen and I know change can and it can happen with each and every person in here by caring for others. By taking an active role in their lives. When I was told that I wasn’t going to live … When the doctor said with toxic levels of chemo, you will not survive this. I didn’t think about all the things that I’ve never done in life. I didn’t think about all the money I’ve never made and things like that. I thought about the legacy I was leaving behind and I thought about how many lives have I touched? THREE YEARS AGO many people looked at me like I was crazy when I wanted to start a business that focused on friendship. Today, the hard work and passion is yielding incredible results. Those that couldn’t understand the vision back then, are now finally seeing the power of a few dedicated people and their commitment to making a difference. A special thanks must be given to my business partner in friendship, Laughing Eddie Lobo (Co-Founder), Garland Guidry (Blog Editor), and to our incredible #FriendFamily that have given of their valuable and limited time and financial resources to help us grow. FRIEND MOVEMENT is a lifestyle brand that is, “Supporting and empowering people to accept and be their true selves.” We are shifting the conversation from “Anti-Bullying” to “Pro-Friendship” and have purposefully chosen to focus on the positive side of the challenges that our communities face each day at school, at work, and at home. Through ART, MEDIA, and EDUCATION we are sharing our message of friendship and openly discussing ways that we can show up in the world as better friends, to ourselves and to others that we meet. 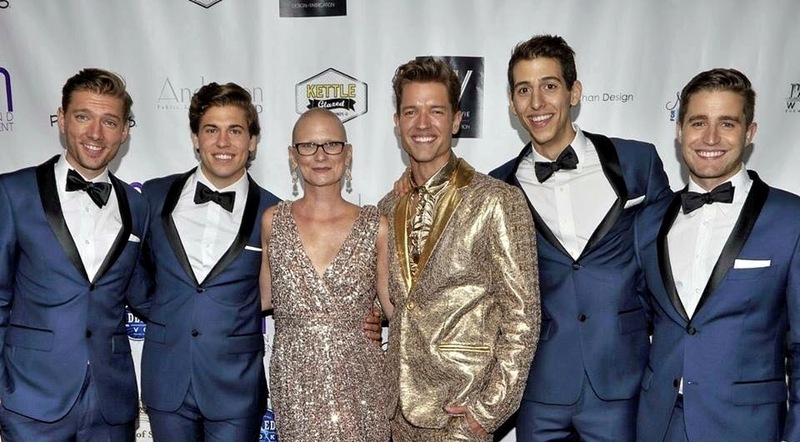 Since our emergence into the world in 2012, we have produced powerful photo-campaigns, published interviews with celebs, hosted incredible networking events, fed those in need, appeared on popular TV Shows to share our message, connected with people from around the world via social media, and so much more! Friendship is universal. It transcends race, religion, gender, sexual orientation, socio-economic status, ability, and any other label we have created to separate ourselves from one another. Human beings are naturally social creatures, we want to be connected and actually thrive on the connections we make. However, we tend to focus so much on how we are different, that sometimes we fail to see just how much we actually have in common. Our diversity is to be celebrated of course, but it is our human experience that bonds us no matter where we are in the world. Our #FriendFamily is growing stronger by the day because people are resonating with our simple yet profound call to action. We are a grass roots effort that is simply moving through the world with love, kindness, and compassion in hopes that others will be inspired to lend their unique voice. There is so much work to be done, but if we all do our small parts — BIG THINGS happen! 1. Add FRIEND as your MIDDLE NAME on social media. 3. “LIKE” and interact with us on social media. Consider sending 1-3 minute videos explaining, “Why FRIENDSHIP is important to you” via dropbox or attachments to info@friendmovement.com. We’d love to post your videos. 4. Are you a writer? We are looking for CONTENT CREATORS and BLOGGERS to join our #FriendFamily and share their unique friendship stories from around the globe. 5. Are you great at raising funds? We are looking for you to help us get our message out and acquire the much needed funds it takes to build and sustain programming. 6. Are you a business selling cool items that would be a good fit for our FM STORE? We want to discuss featuring your products. 7. Are you an artist that wants to be seen/heard and use your talent to make a difference? We want to hear from you and perhaps have you perform at one of our events and/or use your music for our videos. 8. Are you based in LA and great at managing talent? We are looking for you to help us with our MOTIVATIONAL SPEAKER PROGRAM and our new TALENT MANAGEMENT DIVISION. 9. Do you have time to volunteer? We always need volunteers to come out and help at community service and networking events. We are also in the middle of creating FM STREET TEAMS to go out into the community and perform, “RANDOM ACTS OF FRIENDLINESS“.